This Middle Eastern salad forms part of a mezze, where it is typically enjoyed with flat crisp bread. The ingredients traditionally include bulgar wheat, tomato, cucumber, herbs such as parsley or mint, garlic and olive oil. 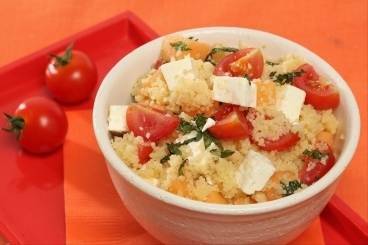 Cous cous salad with diced melon, feta cheese, tomatoes and mint. Scallops dusted with cumin and seared in a hot pan. Served with tabbouleh and a harissa drizzle.